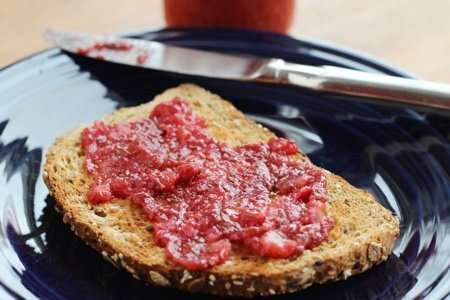 This strawberry refrigerator jam can be made right now (even though it isn’t strawberry season. Frozen strawberries give you a blast of spring flavor when we need it the most (winter). They are less expensive than the fresh version and for this recipe –you don’t need the fresh version. 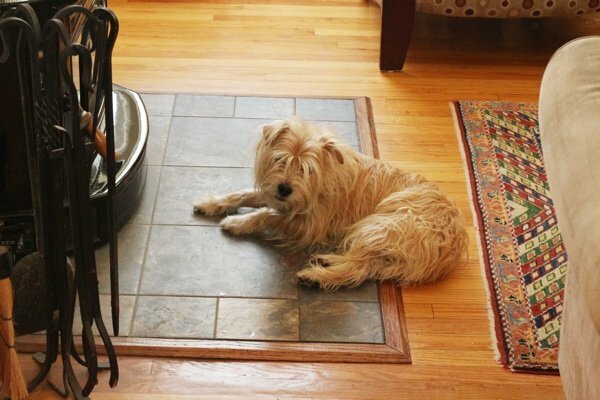 Winter is a tough time for a healthy food blogger because the inspiration isn’t happening. Usually, I go to the store and see fresh produce coming in and I get excited. This time of year, I simply want to sit on my couch, drink red wine, and eat cheese. Needless to say, if I wrote about what I want to do rather than strawberry refrigerator jam – this would be another kind of blog. This jam is made with chia seeds. I can find them everywhere including Aldi (only $3 per bag). Chia seeds (like most seeds) are incredible nutritious – high in manganese, omega-3 fatty acids, fiber, protein, etc. – AND (the best part) they make food gelatinous. They thicken anything you put them in and so they make great pudding - chocolate pudding with chia seeds, overnight oatmeal and jam. You don’t need pectin or any added sugar to make this work. Ordinarily when you make jam, you add sugar as a thickening agent (and because it tastes good). Here you are using chia seeds to thicken the jam and fresh pitted dates to sweeten it. This is ridiculously easy in a blender and then you simply store for 90 minutes in the refrigerator and it turns magically into a thick fruit spread. I do have a high speed blender and while effective it is very loud. I don’t know if you can see him but my dog is in the background of the photo. You can see he wants me to stop making strawberry refrigerator jam. Too bad, Milo! 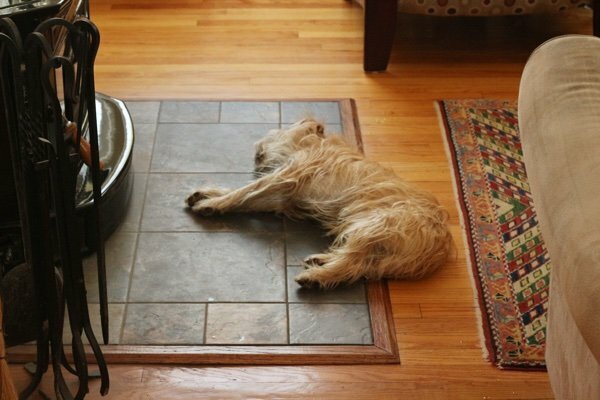 Time to stop snoozin’. Put it in your yogurt, on your toast, on ice cream, or just eat it as a treat! Yum! 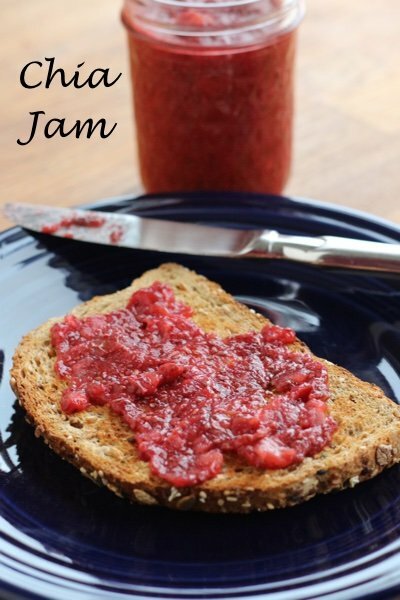 This is a great alternative to high sugar jams and spreads. 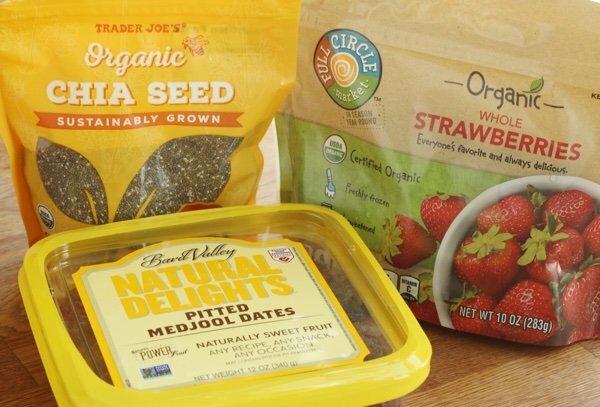 Don’t tell anyone about the chia seeds – they don’t need to know. 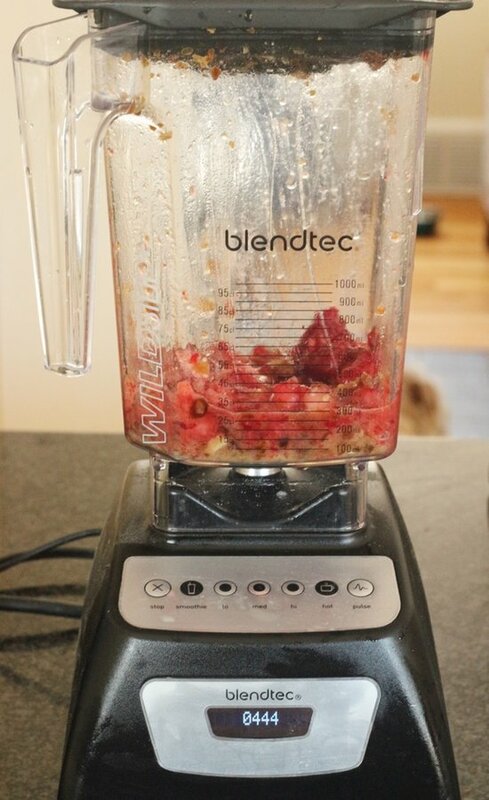 Blend dates and water until dates are chopped. Add 1 cup strawberries and puree. Add second cup and chia seeds and pulse a few times to ensure you still have some chunks of strawberry. Put in refrigerator for 90 minutes and enjoy! This will keep in your refrigerator for one week. This is just plain cool. A little food magic. Do the chia seeds fork over their nutrition even if they don't pulverize? Fresh pitted dates? How about the dried dates available everywhere? Will they work? Oh this looks very good! I'm definitely going to make this. Jennie, no either way nutrition wise it stays the same. Adding nutrition to jam, man, these chia seeds really get around! This is brilliant. I still make the chocolate chia pudding you posted, its sinfully good. Now I'm wondering if chia strawberry pudding would be a thing to try. This is fun cause its so healthy. Love your creativity Lisa! How long does this last in the fridge? Not that I think it would stay very long, but how long could it be stored? @Cassie - this lasts for a week. It has no preservatives so it will go bad. Thanks for your question!! Could this be frozen too? Can this be used with other fruit? I was thinking frozen blueberries or peaches? I tried this about a week ago and it was delicious! @Elsie - the dates you see in the store are perfect for this recipe. @Milk - yes, this can be frozen! Thanks so much for the great questions! Can you use fresh berries? I think I will try with only two dates as strawberries are sweet enough. Love this. @Sue Anna - Yes! Fresh berries will work. Thanks for your question. Lisa - we need a "like" button :-) Without having to go to FB! Has anyone tried this recipe using sugar substitute like Stevia? We can't have the sugar that's in dates. Thanks. I was looking at some jam recipes on Pinterest that I wanted to try a few nights ago but I refuse to add 2 cups (or more!) of sugar to anything I eat. Brilliant to use chia seeds and dates, I think you could also use honey, so no refined sugar is needed. I am now going to frantically search for those two recipes again haha! Thanks,Snack Girl!! !